The Triposo iPhone, iPod Touch, and iPad app is a handy guidebook to help you plan, thrive, and enjoy your vacation. The intuitive interface, brilliant navigation, and elegant visual presence make it a sophisticated, current travel resource. The free download from the iTunes App Store gives you a wealth of information in a chic package. The Triposo iPhone app starts quickly – without introductions and endless account set-up sets. You may choose to jump straight into the content, or you can create an account. If you use a Facebook authorization, you must allow access to public profile, friend list, email address, check-ins, events, likes, as well as your friends’ check-ins, events, and likes. It does not post on your behalf, nor does the interface knock you over the head with prompts to share socially. You can choose to establish an account with an email address as well. I spent time with the Triposo iPhone app without a sign-in and with one, and I did not notice any difference in the content. Ads are tucked into the content in a similar way to Facebook timeline suggestions, but they do not diminish the experience. You enter a search for a place, and your screen transforms to a feed for that location. Each piece of content has a crisp, lovely photo with a title and brief description. An icon that looks like an Android share icon resides beneath each photo. A touch on it leads you to a new feed with greater details about your chosen piece of information. For example, if you search for a country, then, a main city will have a photo, title, and description in the feed. When you touch on the city, the new screen becomes a city guide. The city guide is a beautiful feature. In the cover photo, a tap on the words “All things to do” should be your first stop. Several categories of background information are presented. The country’s history, transportation, common customs, and other pertinent details provide a quick snapshot. You tap the back icon to move back to the city guide. A feed of categories appears. Hotels are highlighted. Cultural options are included, as well as shopping, food, museums, churches, parks, and more. With each category, you can touch the map icon to view locations on a map. The interface is bright and engaging with its great content and excellent photos. Helpful tools are sprinkled throughout the Triposo iPhone app. You can touch the save icon to help you build your itinerary. At the top of each screen, you can tap the download icon and the information is available off-line. 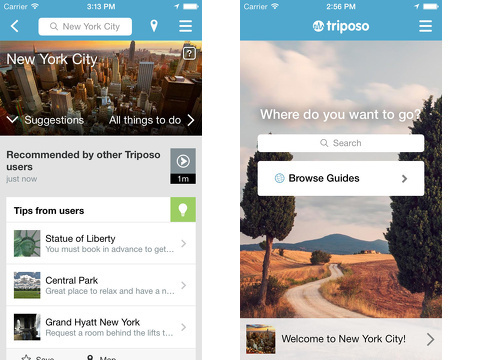 For some hotels, you can book from within the Triposo iPhone app. You can add your perspective on a specific location. The content is unexpected. There may be an in-depth article about a particular artistic movement that found its start in a city. The content brings more dimension to the user experience, as well as gives you more context to enjoy your vacation. 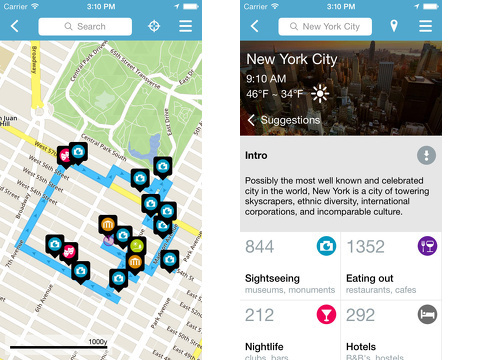 Triposo is an elegant, intuitive, and insightful iOS travel app, and you should download it. AppSafari review of Triposo was written by Jenni Ward on February 19th, 2014 and categorized under App Store, Free, iPad apps, Reference, Travel, Universal. Page viewed 5708 times, 6 so far today. Need help on using these apps? Please read the Help Page. Great for assistance with directions and a wealth of resources very easy to obtain. This review is great. Thanks.